Many marvel at China’s bamboo shooting skyscrapers, but they might have overlooked the enchanting beauty in the rural areas of this country. Each year, tens of thousands of people travel to these regions. 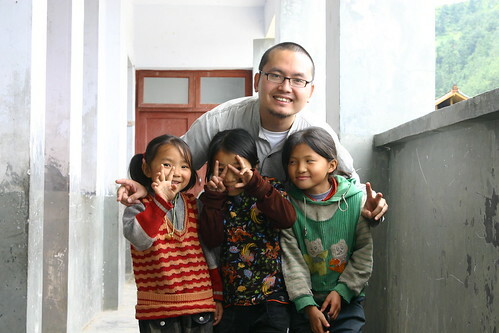 Andrew Yu is one of such many but the only who came up with “Voluntourism”, an innovative concept behind his social enterprise project “1KG”. Andrew Yu (余志海), or An Zhu (安猪) by nick name, is a traveler who has been to most of the provinces in western China. In 2004, Andrew got his epiphany from what he saw at rural schools and started the 1KG project. The idea is to encourage people to take some small gifts to country kids on their trips. There are over 800 schools with registered information at the 1KG website, all uploaded and maintained by the community. Travelers can collaborate through the website. Andrew believes in the power that millions of people taking small steps can change the world, or “democratization of participation”. He advocates that every single human being has the capacity for charity, which should not be controlled by a small bunch of experts and big philanthropies. Thirty years of economic development in China made possible the emergence of a newly rich middle class in the city. Many rural residents, however, are still living on the edge or under the poverty line. From government to each unprivileged family, hope is put on education to pave way out of poverty. In 1989, Project Hope was initiated to help children whose families are too poor to afford a complete elementary school education. Being the largest and most influential non-governmental welfare project in China, it had financed education of more than 2.6 million poor rural students by the end of 2004. Despite its phenomenal success, financial and information resource constraints still widely existed as there are currently about 60 million children living in the vast rural areas. Among them, one third (20 million) are poverty-stricken. It is obvious that top down approach in public service plays an essential role, but it’s far less than enough. Historically, China has been family-oriented rather than community-driven. Thus, relatively few philanthropic were giving outside of the family. In addition, Confucianism and Chinese Marxism promoted a culture in which social and political issues are viewed as being primarily the domain of the elite. A 2009 survey by the China Social Entrepreneur Foundation and Horizon Research Consultancy Group even revealed that 63.3% of survey participants rarely talk to others about public welfare issues even though they are actively involved, and over 20% of respondents never discuss such issues. In such a reality, can the general public be mobilized? Voluntourism refers to the idea that every traveler may help their destinations’ local rural communities. Contrary to traditional thinking, it advocates “casual philanthropy” that should be happy and fun without much commitment on time, money, and effort. Although as mentioned earlier, philanthropic activities are often carried out by conscientious individuals and have not become a collective action in China. It is, to a large extent, the narrow definition on philanthropy that restricted mass participation. Traditional Chinese philanthropy is often altruistic and one-way, carrying the lofty mission to return to the society and contribute to the homeland. Voluntourism with its key focus on “happy”, “casual”, and “fun”, instead, puts away intimidating burden and brings in add-on, interactive experience for each participant. American psychiatrist William Glasser once said, “We are driven by five genetic needs: survival, love and belonging, power, freedom, and fun.” Recent years’ economic growth transformed the consumption pattern of urban Chinese residents from subsistence to a comfortable life. Thus, the shifting of people’s focus on survival to needs such as love, power, freedom, and fun. Voluntourism, therefore, speaks from its core to the application of this theory. Statistics shows that over 500 million Chinese travel domestically each year to rural areas where natural and humanistic landscapes are well preserved. Among them many are young professionals and college students–an inspiring younger generation who are at large much more socially conscious, open-minded, and well-educated than their father’s and grandfather’s. What if they can carry 1KG more books, stationery and other education related material to donate to schools and children along their journey? This primitive idea gave living water to Andrew’s good will to help on rural education. 1KG initiated with this simple and approachable idea–passing on 1kg of books or stationery to unprivileged kids that volunteers may meet while traveling. As it evolves, the key element of Communication was also added in. In addition to material help, volunteers also bring to the needy information of the outside world and help to build up kids’ self-confidence by talking to, playing with, and getting to know them. The interactive communication approach, in return, exposes volunteers on a deeper level to the local culture, education, economy and development demands. Most importantly, the experience helps to create a very special bond between the volunteers and the kids and their families, which may lead to continued relationship in the long run. In less than 6 years after 1Kg’s official kick-off in 2004, “over 250 trips were planned by volunteers every year; more than 10,000 people have participated in 1KG’s trips; more than 600 rural schools covering most of the sightseeing spots in the rural area of China have been recorded in details and publicized on its website; At least 1 million people have felt the knock-on effect; Volunteer groups have been organized in almost all the major cities of China.” These are achievements that even amazes Andrew himself. As one of the fastest growing NGOs in China, what factors are contributing to 1KG’s significant growing momentum? The borrowed phrase “Open source” can’t be more appropriate to reveal the secret. In the IT field, it basically means to open the source code for the aim of enabling “a self-enhancing diversity of production models, communication paths, and interactive communities”. The open source model includes “the concept of concurrent yet different agendas and differing approaches in production, in contrast with more centralized models of development”. 1KG organizers have a practical idea to offer interested public and believe in the power of collaboration and collective wisdom as what Wikipedia had demonstrated to us. Having recognized its effective role as a designer, 1KG decided to focus on building and optimizing its interactive online community 1kg.org, providing user friendly platform so that scattered volunteers can search and implement essential data about rural schools, communicate with peers in interest groups and 1KG forum, share information on activities such as trips, teaching opportunities, fund-raising, and meet-ups. Instead of constraining the creativity of participants as most traditional NGOs do, 1KG opens it up. This is as if opening the source code to developers, enabling the maximum utilization of resources and expertise. Touched by 1KG volunteer Sicilia’s charity book sale, two volunteers named Bai Wei and David launched a mini-campaign in March 2009. The campaign calls for people who can’t participate in 1KG trips to pick ten kids out of a pre-defined list, sell ten children’s books to their family members and friends, have book buyers designate a book receiver out of the ten and write down wishful messages on the book, and then mail books to the kids. Successful examples such as this are constantly shared on 1KG’s website and many other online channels, inspiring more people to join the cause. Andrew Yu has a dream. A dream that instead of being purely a charity project, 1KG will one day transform into a type of culture or lifestyle through which the brand can have a sustainable future. With much work ahead, his center of focus is set on “design”. In the traditional sense, design is about “developing concept and making models for something new that will be made by someone else.” However, modern design goes far beyond that with a craving for experience. When applying the idea of “design” to 1KG, it helps tremendously to re-visit and re-define the role of charity organizers in a collaborative world. Having exhibited an open-source characteristic, 1KG poses even more challenging tasks than common causes for Andrew and his co-workers. How can the team help to deliver volunteers joyful and refreshing experiences time and time again? It is essential that adequate support on information, tools, and methodologies can be provided. Even more importantly, how can the team create an effective and efficient platform where volunteers may share meaningful experiences and get inspired? How can the team identify best practices from the community that will serve well for other volunteers? How can the team design mature processes for such best practices that will eventually enrich the 1KG brand? “Sometimes knowing nothing is lucky”, Andrew once said. When he get started, he hadn’t even heard of NGOs; However, with a good eye and an open mind, Andrew was led accidentally onto the volunteer-driven approach, which later turned out to be quite a success. He possesses the right type of self-confidence and humility attributes which are deemed important from design and branding point of view. Going forward with a staying hunger and staying fool attitude, 1KG would most likely jump onto the right wagon and go on a sustainable track. As a 1KG team member once said: “When every individual is involved, the world can be changed.” Let’s all wish Andrew and his team the best of good luck! Born in Hunan, China, Jia Liu is obsessed with food, culture, and languages. With an M.A. degree in Integrated Marketing Communication, she has marketing agency experiences in new media strategic planning and research for the B2B industry. Her ultimate passion lies in brand consulting with regards to health and sustainability. Currently she resides in Boston, selling localization services for a China-based outsourcing vendor. Enforce a recognition from wired correspondents that operate at this service published here!